Flood on Dorset Stour 09 Jul 2012. The average rainfall in Dorset for June 1991-2011 was 51 mms. 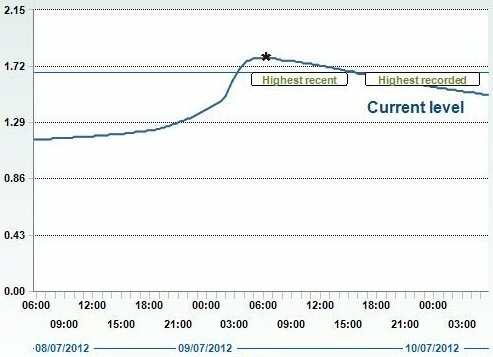 Between 04 June - 08 July 2012 Dorset experienced 281 mms in 34 days, an increase to 550%. 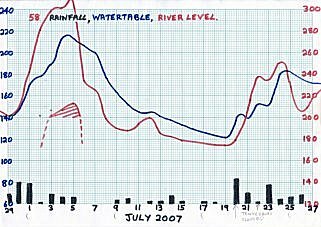 This caused a flood of the Dorset Stour 08-10 July, "higher than any recorded before" (average 106%) at 9 of 11 monitoring stations run by the Environment Agency on that 70 mile river. Statistics made public online by E.A. 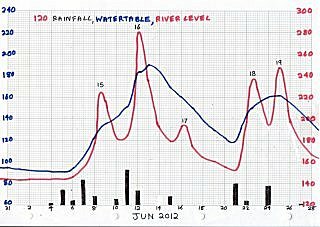 are shown below, together with graphs of river levels permitted by E.A. The direct cause of this increase is a move of the summer jetstream over the UK from North of Scotland to over Spain, allowing a series of low pressure areas to pass over England. Something similar happened in 2007. 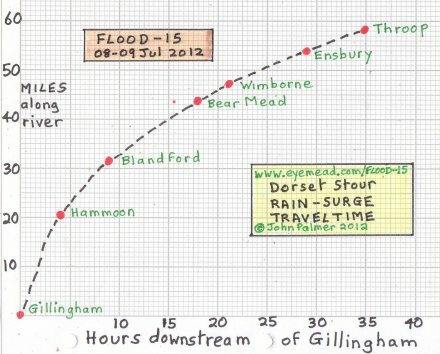 Rain surges #15 to #20 passed down the Stour between Gillingham and Throop, followed by #21 on 08jul2012 which produced the unusually high flood. At Bear Mead, the flood plain stretches 800 metres South of river and 1000 metres North. Most of this is rated at 1 in 100 chance of flooding each year by Environment Agency. 60 hours after a peak of about 390, the river level at Bear Mead was down to 240, and most of the surface water had drained away or was hidden in the dense well-watered summer vegetation, leaving a cloud of summer brown butterflies fluttering in the sunshine. 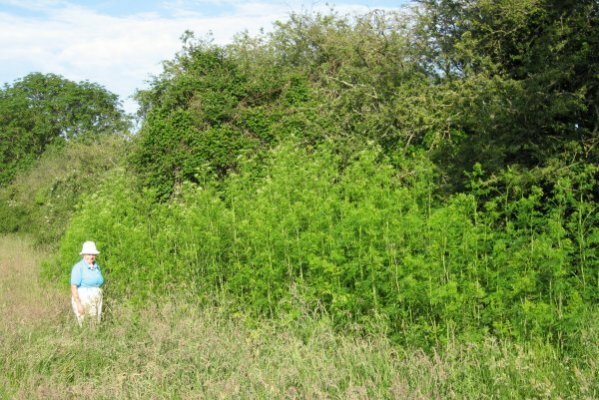 The increased rainfall in summer also caused overgrowth of grass, nettles and plants like poison hemlock, musk mallow and oxeye daisy. 1. The jet stream has shifted further south than usual, bringing wet and windy weather to the south of the country, making summer 2012 similar to summer 2007. The Dorset Stour floodplain, pictures centred on Eye Mead, SY 995-995, Eye Bridge left foreground, (see degrees of Flood). FL3220. 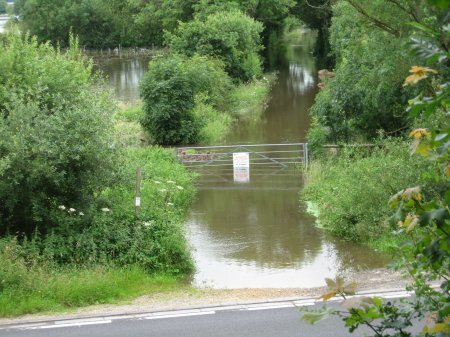 Flooded bridleway to A31, 760 yards from river Stour. FL3225. 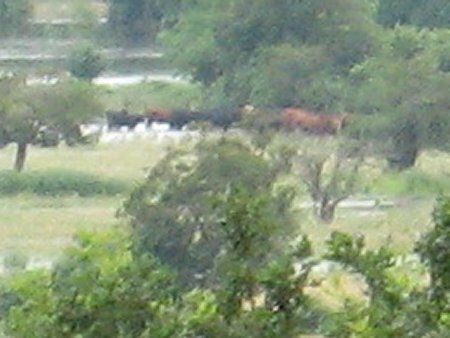 Trapped herd of 36 bullocks, 700 yards from nearest road. HEML3185. Overgrowth of grass and poison hemlock. FL3209. 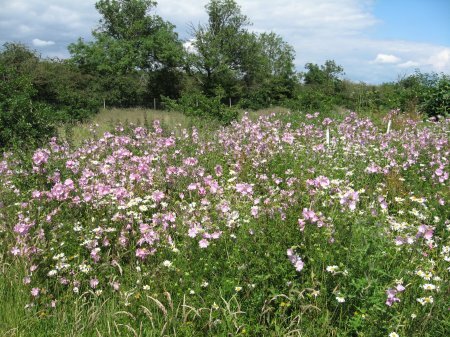 Overgrowth of musk mallow and oxeye daisy. Jetstream patterns and causes in 2012 seem similar to June-Aug 2007.